I have finally learned why people are so quick to declare that "the west coast is the best coast." My first visit to was all the more special because I was visiting my man-friend for the first time since he moved to L.A.. 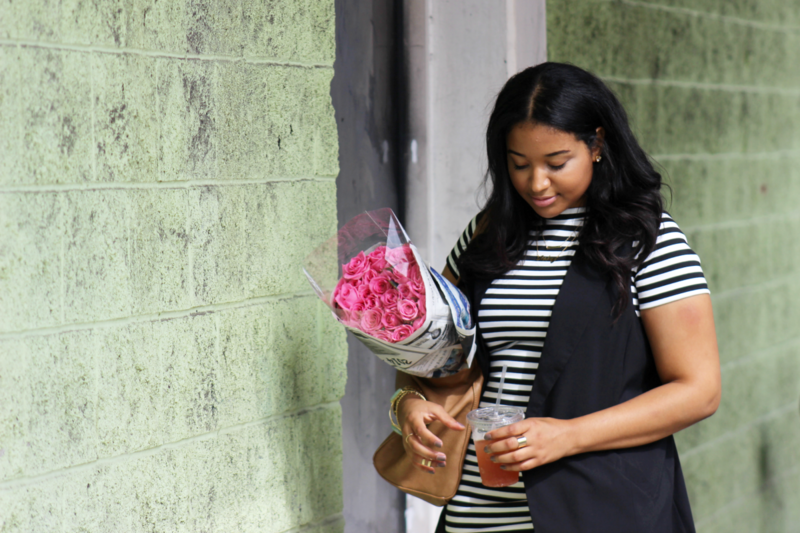 Following my Cali friend's guidance, my first stop was DTLA's Flower Market, a beautiful warehouse filled with fresh, bright and super cheap flowers. It was a great place to convince my boyfriend to buy me two dozen roses for the whopping price of five whole dollars. It was also a great place to wear my Boyfriend Vest from Wet Seal +. Since DTLA is notoriously cool, this oversized blazer vest helped me blend in, disguising the tourist vibe I'm sure I was giving off by taking pictures of everything. Even if I did come off as a tourist, at least I did it with a beautiful bouquet, the perfect blazer vest and a sweet boyfriend by my side. The "BOYFRIEND VEST" was c/o of Wet Seal. All opinions are my own and were not influenced by the brand. You've inspired me to start blogging again. Thanks. You look fabulous girl, love that dress with the blazer. It sounds like you had a great time in CA!! That dress is beautiful - I love the cut of it. and I really need a vest like that! Don't even tell me how cheap those roses were - they are beautiful! Love the vest!! Kendra Scott giveaway on the blog!! Wow welcome to Los Angeles pretty girl - you are totally LA cool in this look!!! Love love love that dress! And you look fab! You look beautiful! I love that dress! So gorgeous!! Obsessed with that vest and that dress is amazing on you! I just shot an outfit so similar to this for next week! I swear we are fashion soulmates! Haha! I have that vest in white, it looks fabulous with this dress, i may have to try it. I just ordered this dress actually! 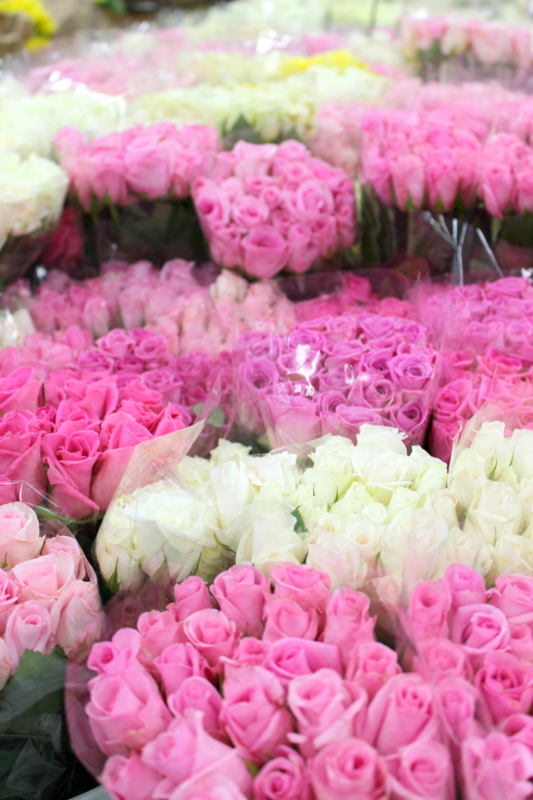 Love DTLA flower mart, beautiful pink roses. What a pretty pop the flowers add to the neutral colors, just gorgeous! Super cute! Love this dress! Beautiful, Audrey! So fun and special that you got to go visit your man! Love the vest and $5 for 2 dozen roses unheard of! 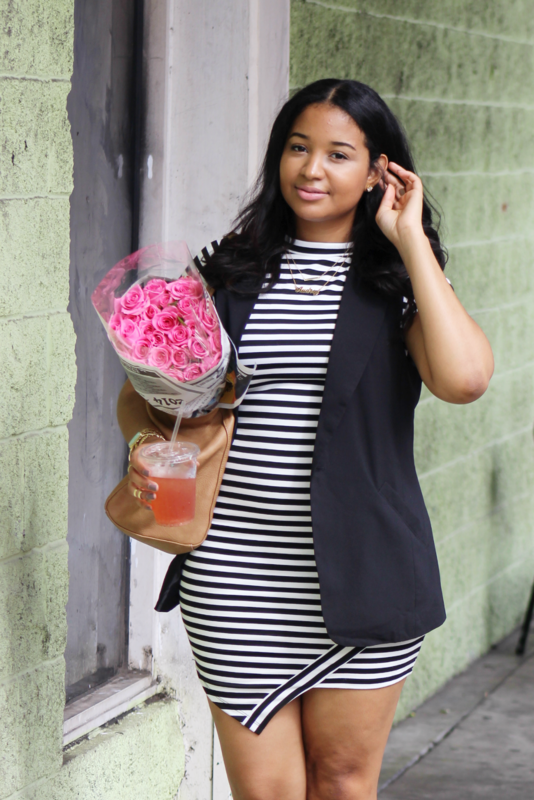 I'm loving the stripe prints and the way you styled it with the vest , your hair is gorgeous and you look amazing. Wow that is so cheap for roses! They're beautiful too! By the way, I like the asymmetrical cut of your dress -- very chic! That is such a great deal for the those roses! I'm glad you had a great time in LA! 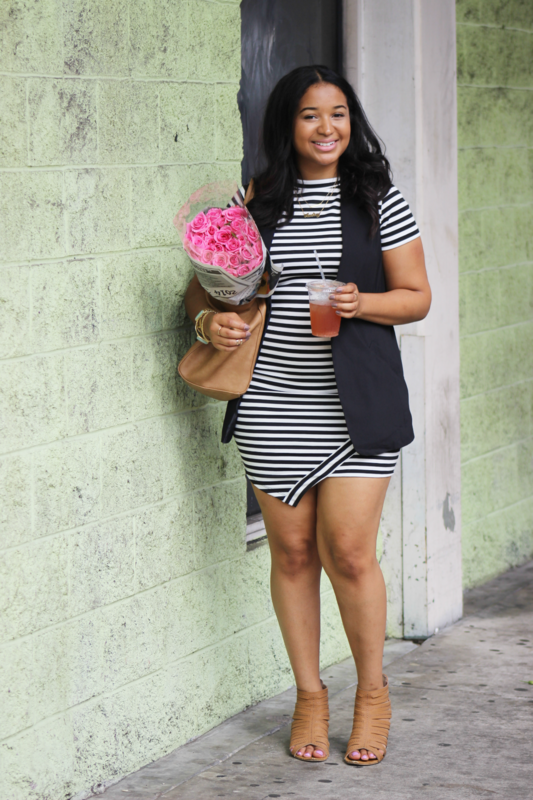 I really like this dress and how you styled it with this vest! Daaaum! That asymmetrical line in your dress is so appealing! I love this look Audrey! This dress is too fun! 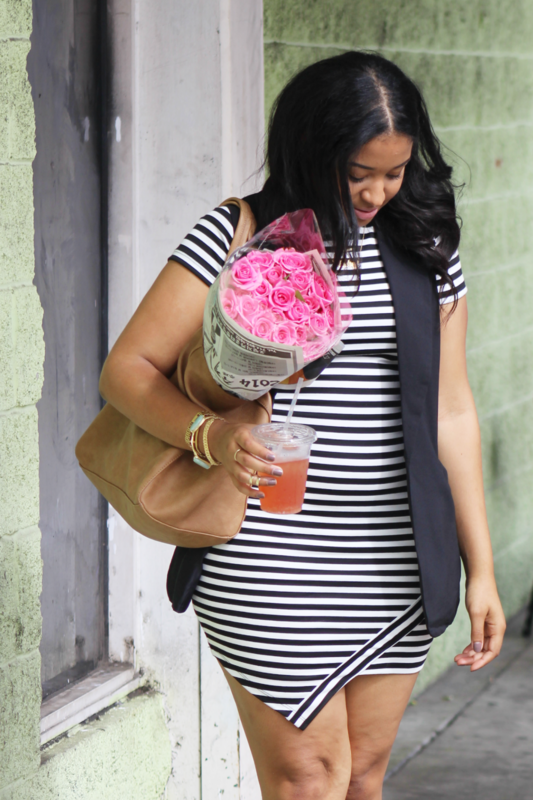 Love the asymmetrical stripes! Omg I have the exact same dress!!! Love this outfit babe! I'm so obsessed with this dress. 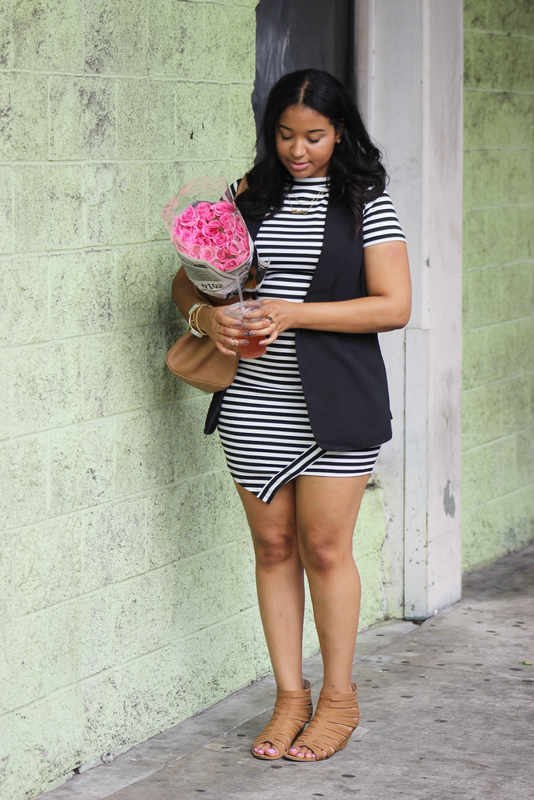 The classic stripes mixed with the asymmetrical hem line is such a great combo! And what a steal on those flowers..they are gorgeous! Glad you are enjoying your trip!